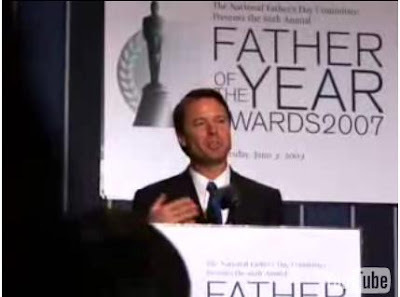 DNA tests reveal "Father of the Year" award winner and noted poverty fighter John Edwards is the father of a child born to Edwards' mistress, Rielle Hunter, multiple sources confirmed to the National Enquirer. The DNA results come after Edwards denied being the father for more than a year. When the Enquirer broke the story about Edwards' affair in 2007, he denied it. It was not until mid-2008 that Edwards finally admitted the affair (after having been caught red-handed), in an interview aired on ABC's Nightline. Despite acknowledging the affair, Edwards has maintained that he is not the father of Hunter's child. You think McClatchy will give this report the exhaustive coverage it gave to South Carolina governor Mark Sanford? I'm not counting on more than a little story here and there, because this story doesn't fit McClatchy's preferred "GOP is the party of corruption" narrative. Don't forget: Edwards somehow conned a former campaign worker named Andrew Young to claim he was the father. (You think maybe a payoff was involved?) Edwards also apparently concocted a scheme to funnel campaign contributions to maintain Hunter's household, for which Edwards is being investigated by the feds. To think this guy was a top-tier presidential candidate in the Dem party. Culture of corruption anybody? McClatchy editor says John Edwards begged him not to report on the scandal: "my sick wife reads your paper every morning"
"please Mr. McClatchy reporter, don't report on this story, my sick wife reads the paper everyday" That is amazing that he would beg for that. Scumbag hypocrite... If you are going to be 'man' enough to shag another woman other than your wife, you got be able to man up when it comes to light. Will you just stop! You’re supposed to only and exclusively use MSM/AP articles authored by real and true journalists for your blog. The National Enquirer doesn’t count! Oh, you mean the MSM refused to print anything about Edwards love child? You mean they covered up for him, like they are doing right now, like during the election. Why is it to find out any news of DEMOCRATS you have to go to the tabloids, while the MSM is more then willing to go cover to cover with Republican scew ups? I want to read about McClatchy layoffs, who is coming and going, lawsuits, etc., not conspiracy theories about McClatchy being pro-democrat, anti-GOP. Could you please get back to keeping me informed about what's going on at McClatchy? I want NEWS, not paranoia. This just CAN’T be true! Andrew Young said HE was the father! Imagine if the media hadn't covered for Edwards, we may not have gotten Obama. A Dem presidential candidate caught in (another) lie, and the mainstream covers Zero’s staged town hall. This guy makes Sanford look like a chivalrous knight. Where is our Sanford troll at today anyway? I guarantee you that when MSM picks it up it will be in McClatchy's papers or on the websites. Someone other than the National Enquirer and Perez Hilton has to officially confirm it. Textbook example of 'Sin of Commission". A Sin of Omission is failure to do what one can and must do. A Sin of Commission is to know something is wrong... and do it anyway. ...I believe, 9:06, it was a sin of emission. They were honoring him for "fathering" a child in 2007. Checked The Star, no news about this there. No local news, no national news, just more bs from the morons on the editorial staff to embarrass and oppress our community. I did hear Liz say during her book hawking, that she did not know if John was the father of the baby or not. Who would believe that? My sister knows if her husband tries to wear his socks twice. Get real, she knows! What a liar, her whole book was probably a lie. Liz hawked her book on every liberal news show, but conservative writers won’t even get a second of airtime. It doesn’t work libs, Glenn Beck has a best seller without you, get over it! You say,“I want NEWS, not paranoia.” I can easily see why you need to come here for news, but if you find paranoia you recognize here, but not in the MSM, then I can’t help you. This site is not just about McClatchy per se. It is about the biased slant to the news, in the MSM, and perpetuated by McClatchy. The corrupt media brought us Obama, and the people are speaking out about the coordinated fraud that did it. I consider this my little townhall speech, and I am entitled to my opinion. Oh no, did that sound fishy? Why would the Star report on it when the ONLY 2 sites according to Google News that are touting it are gossip sites? You ask them to accurately report the facts, yet you get mad at them for not reporting on something that has NOT been confirmed. Maybe, you never know. When I worked there the grape vine knew what was going to happen before 99% of the managers. It was so bad that if a foreman wanted to know what was going on, he didn't go to the production manager, he went to a secretary, a janitor, the nurse, or the girls in the classified department. I can see where there would be a hint of truth. That building at 18th and Grand is one expensive MF to maintain but would make a fantastic spot for a manufacturer with the underground access to the rail line. They could easily scrap all the employees outside a skeleton crew and move them up the street or into a strip mall, the library or one of the abandon office buildings dotting the downtown land scape on the cheap. One thing is for sure, the company itself wouldn't dream of reporting it until the last second. Can you imagine a McClatchy paper sitting on the news of an affair about a republican senator and presidential candidate? How does this confirmation thing work? if no liberal paper reports something then it didn't happen? Enquirer broke the news last time if I remember right. If you wait on the monolith liberal press, you will wait forever. They only carry bad news about democrats when they absolutely must or when they campaign against Obama. There has to be some "news" outlet that you "trust" that you would believe over NE and Perez. The notion that the Enquirer has more credibility on this issue than the MSM is indeed astonishing. How sad for the MSM that they have trashed their credibility so badly. Last time, the MSM all knew the truth; they just wouldn't print it. DAMN THEM! DAMN THEM for reporting on this! What ever will you guys have to complain about? I can blame them for getting scooped on hard news by the enquirer. I can blame them for sitting on the original story about Edwards infidelity until practically every other outlet in the country reported on it. I can blame them for sitting on the story because John Edwards asked them to. Right after the local TV station ran the story the Charlotte Observer finally came um...clean. They sat on the story as long as they could. Charlotte Observer story is about six pm EST last evening. As of this AM...nothing in the Raleigh News and Observer on line. In Raleigh it still didn't happen. John Edwards is a scumbag who used the illness of his wife for free press conferences and exposure while he was banging away on his mistress on the side. And the press swallowed his act, as if he was the 2nd coming of Christ, hook, line and sinker. And the liberal press just doesnt understand why people are flocking to Fox news.